Airports Authority of India Has Published Notification For The Recruitment Of Total 200 Post . 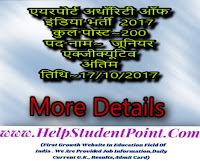 Interested Candidate May Check The Eligibility Criteria And Apply Online From 18-09-2017 To 17-10-2017 .Other Details Like Important Date, Total Recruitment ,Recruitment Name, Name Of Organisation , Monthly Pay, Age Limit, Educational Qualification, Selection Process , How To Apply Application Form , Useful Tips, Official Notification And Official Website, Etc Are Given Below.You Can Ask Any Questions Related This Recruitment You Can Write Comments Box. Educational Qualification~Candidates Must Have The Qualification Of B.TECH Degree WITH selection in Gate 2016 exam . More Full Details Check Official Notification Below Link. Selection Process~Selection will be shortlisted on the basis of GATE Marks 2016.